HISTORIA GENERAL DE ESPAÑA, 2 VOL. - 1678 García de la Iglesia, Madrid 2 vol. 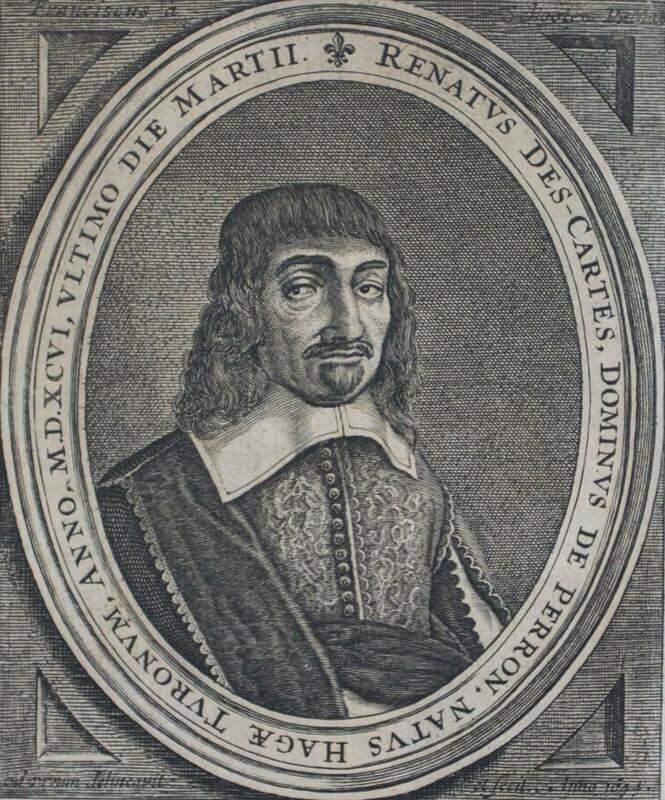 .en esta última impresion de Don Felix Lucio de Espinosa y Malo todo lo sucedido desde el año 1669 hasta el de 1678. Escudos. 18 h. 751 pg, 13 h.6 h. 622 pg., 7 h. 30x22 cm. Enc. posterior pergamino. Trozo de lomo en mal estado. Para ver o recibir fotografías de los libros puede ir a nuestra web. London: printed by A[ndrew]. C[larke]. for John Martyn, printer to the Royal Society, at the Bell in St. Pauls Church-Yard, MDCLXXVIII . First Edition thus. Paneled Calf. First Edition in English of "one of the most important treatises on ornithology of all time, being the first systematic classification of the birds of the world." (Wood). Folio: ,53,,55-271,,273-441,pp, with 80 leaves of plates, most unsigned but some credited to Thomas Browne and three by F. H. van Hove, two by W. Faithorne, and one by W. Sherwin; two full-page letterpress tables. The two engraved plates showing techniques and equipment for snaring birds, often bound at p. 28, are here grouped with the 78 numbered plates (depicting more than 200 species) at the end. An excellent example, beautifully bound to style in recent speckled and paneled calf, spine gilt in seven compartments divided by raised bands, end papers renewed, title page in red and black. Binding pristine, book block generally clean and unmarked with widely intermittent spotting, one table with short closed tear (no loss), several plates lightly foxed, one plate shaved at outer edge with trivial loss. Wing W2880. Nissen IVB 991. BM(NH) V, p.2331. Wood (McGill), p.629. Zimmer (Ayer Ornithological Library), pp. 676-78. Anker (Copenhagen) 532. Lowndes 2939. In the 1660's, John Ray and his pupil (and, later, patron) Francis Willughby toured the Continent, gathering material for their planned complete classification of the vegetable and animal kingdoms. After Willughby's early death in 1672, which deprived Ray of both a collaborator and a friend, Ray took over his notes, and, having edited the incomplete manuscript and added his own observations, published Francisci Willughbeii ornithologiae libri tres; totum opus recognovit, digressit, supplevit Joannes Raius, in 1676. The present work, a translation by Ray, was published two years later and includes three more plates than the Latin edition as well as an expanded text, including three additional sections by Ray on fowling, falconry, and songbirds. In all, Ray and Willughby described more than 230 species, which they had themselves observed. Ray's systemization was revolutionary (Zimmer calls it the "cornerstone of modern systematic ornithology"), preserving the broad division of land and water birds, but rather than subdividing functionally, on grounds of diet, singing ability, and other behavioral traits, he introduced a classification based on anatomy, using for criteria foot structure, beak form, and body size. In the preface, Ray writes that the plates, despite some difficulties in communication between himself and the engravers, "are the best and truest, that is, most like the live Birds, of any hitherto engraven in Brass." N. B. With few exceptions (always identified), we only stock books in exceptional condition. All orders are packaged with care and posted promptly. Satisfaction guaranteed. Einleitung in die öconomischen, Policey- und Cameral-Wissenschaften. Nebst Verzeichnis eines zu solchen Wissenschaften dienlichen Büchervorrathes und ausführlichem Register. Mit neuen Anmerkungen zum Gebrauch öconomischer Vorlesungen vermehrte und verbessert von D. Daniel Gottfried Schreiber. 6. Auflage. Ca. 17,5 x 11 cm. (16) S., 328 Seiten. Halbpergamentband der Zeit. Dithmar (1678-1737, Kameralist, Mitglied der Academie der Wissenschaften zu Berlin). 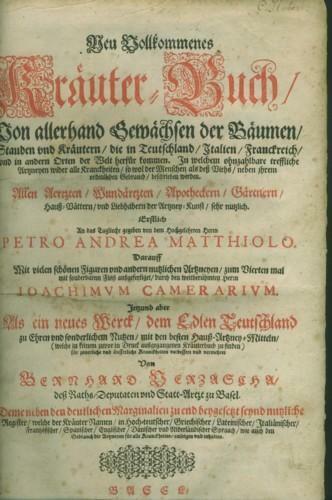 Dithmar wurde auf Empfehlung der damals in Preußen einflussreichen Familie von Danckelmann 1709 außerordentlicher, 1710 ordentlicher Professor der Geschichte, später des Natur- und Völkerrechts an der Universität Frankfurt an der Oder. 1727 begründete Friedrich Wilhelm I. einen Lehrstuhl für Kameral-, Ökonomie- und polizeiwissenschaften an der Viadrina - neben einem gleichzeitig in Halle eingerichteten der erste an einer deutschen Universität. Diese Professur hatte Dithmar bis zu seinem Tode inne. Als Kameralist hat er sich besonders um die Systematik der Nationalökonomie verdient gemacht. Seine noch lange nach seinem Tod immer wieder aufgelegte "Einleitung in die Ökonomischen Polizey- und Kameralwissenschaften" (Frankfurt a. O. l73l) hatte großen Einfluss auf die staatliche sowie gutsherrliche Verwaltungs-, Finanz- und Wirtschaftspraxis Preußens." (Uwe Scheffler: Acht Professoren der Viadrina). Einband leicht fleckig und etwas berieben. Seiten teils leicht gebräunt. Sammelband mit 3 Reisebeschreibungen.- Struys (Strauss), Jan Janszoon. Schultze, Walter (d. i. Schouten, Wouter). Saar, Johann Jacob. Vervolg der leerzaame zinnebeelden, spiegel der boetvaardigheid en genade en eenige stichtelyke gezangen.Haarlem, Jan Bosch, 1758. 2 parts in 1 volume. 4to. With engraved frontispiece, engraving on title-page, 30 engraved emblems in text (ca. 10 x 12.5 cm) by Vincent vander Vinne in the first part, and 4 engraved emblems in text (10 x 12.5 cm) by Jan Caspar Philips in the second part. Contemporary marbled wrappers. - Landwehr, Emblem and fable books 760; NNBW IV, cols. 1260-1262; Praz, p. 502. 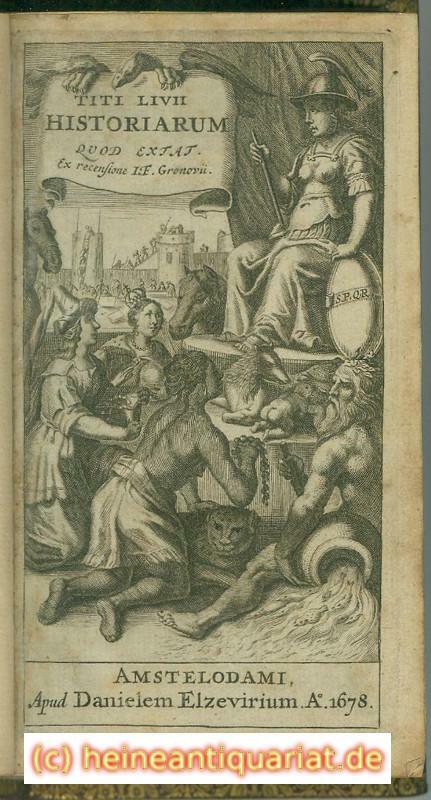 First and only edition of an emblem book by Adriaan Spinniker (1678-1745). 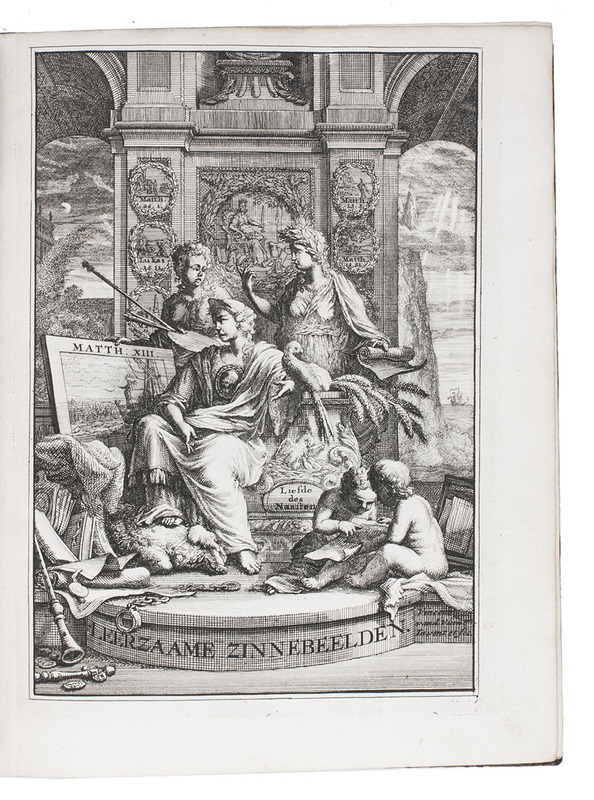 It is an independent continuation of Spinniker's Leerzaame Zinnebeelden (Haarlem, 1714) which contained 50 emblems by Vincent van de Vinne (1686-1742), the grandson of the famous painter Vincent vander Vinne (1629-1702) who was a pupil of Frans Hals in Haarlem. The 30 emblems in the present work are by the same artist, and represent scenes from daily life, scenes in the country, in shops, households, etc. and are accompanied by Bible verses underneath. An explanation of each emblem is given on the following pages in the form of a poem. 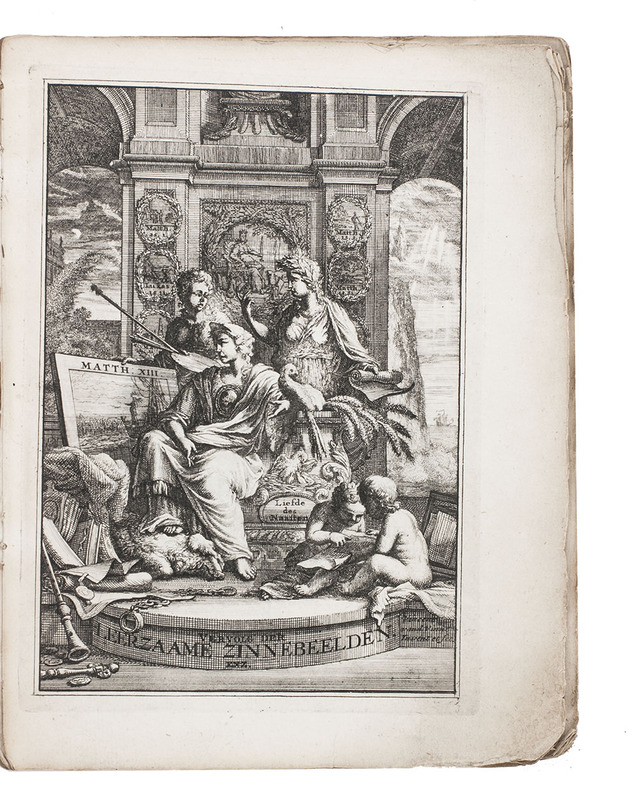 The second part has an individual title-page, Spiegel der boetvaardigheid en genade, and contains 4 engravings by Jan Caspar Philips (1690-1775). 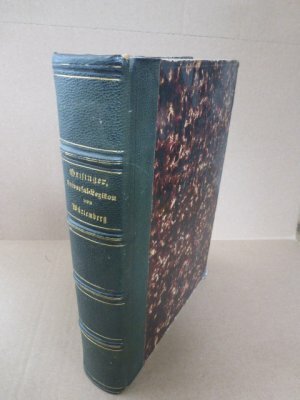 It deals with the concepts of repentance and mercy with reference to Bible passages, and ends with the Stichtelyke gezangen: devout songs.Wrappers damaged, spine has disappeared and bookblock is split. Otherwise in good condition, wholly untrimmed, slightly browned with a few occasional small spots. Basel, Johann Decker, 1678. Folio (350 x 215 mm). pp. (4), 792, (72), title printed in red and black and numerous woodcuts in the text. Contemporary blind tooled pigskin over wooden boards, monogram I.G.W. and date 1681 on frontcover, original clasps. A very nice and attractively bound copy of this profusely illustrated German edition of Matthioli's famous herbal. 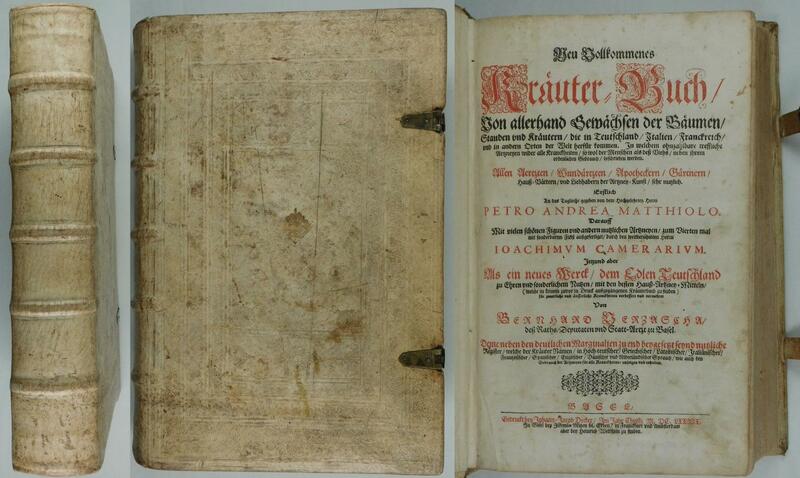 The first edition in the German language was published in 1563 in Prague. 'Pier Andrea Mattioli was an Italian physician whose main claim to fame was his commentaries on the 'Materia medica' of Dioscorides, the fame of which eventually brought him successive appointments as physician to the Archduke Ferdinand I and the Emperor Maximilian II' (Johnston, 77)./One index leaf loose and old owner's signature on title. //Nissen BBI, 1311. Neu vollkommenes Kräuter-Buch. Von allerhand Gewächsen der Bäumen, Stauden und Kräutern, die in Teutschland, Italien, Franckreich, und in andern Orten der Welt herfür kommen. jetz und aber als ein neues Werck. vermehret von Bernard Verzascha. 'By I. C.' [Cunningham, James (d. 1697?) - Attributed to]. An ESSAY, Upon the Inscription of MacDuff's Crosse in FYFE. 1678. Edinburgh: Printed by the Heir of Andrew Anderson, Printer to the King's most Excellent Majesty. 1678. 20 pp. 4to: A - B^4 C^2. 7-5/8" x 5-3/4" Bookplate [Gilmour of Lundin and Montrave, signed in the plate, "A. S. Leslie, 1898"]. Paper a bit grubby from use, with leaves trimmed a bit lean. Old repair to title leaf. A VG copy. TITI LIVII HISTORIARUM QUOD EXTAT. Ex recensione I. F. Gronovii. Traité de la noblesse, de ses differentes especes. Pirotechnia. Nella quale si tratta non solo delle diversità delle Miniere, ma anco di quanto si ricerca alla pratica di esse, e che s'appartiene all'arte della fusione, ò getto de Metalli. Far Campane, Artigliarie, fuochi artificiali et altre diverse cose utilissime. Nuovamente corretta, e ristampata. Mémoires pour servir a l'histoire naturelle des pétrifications dans les quatre parties du monde.The Hague, Jean Neaulme, 1742. 2 parts in 1 volume. 4to. 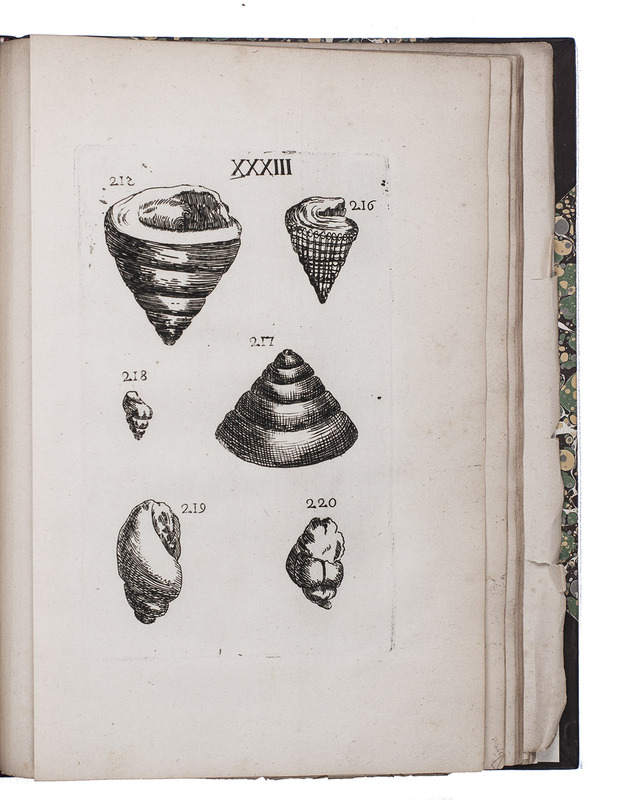 With 60 folding engraved plates with 441 illustrations of fossils and shells. Modern half calf, gold-tooled spine. - Honeyman 450; Nissen, ZBI 498; Poggendorff I, cols. 260-261. First edition of an extensive treatise on palaeontology by the French archaeologist philosopher and mathematician Louis Bourguet (1678-1742). The first part is a compilation of letters relating to Bourguet's previous work, Lettres philosophiques, wherein he compares the processes of the mineral world to processes of the living world. The second part contains sixty plates of fossils, including those unearthed by the author mostly from Switzerland or taken from the works of Lang and Scheuchzer. The 441 illustrations are accompanied by concise explanatory text, a comprehensive bibliography of palaeontology, and a list of international areas where fossils have been found.With the top margin of the title-page trimmed off without losing text and some wormholes, not affecting the text. Good copy. 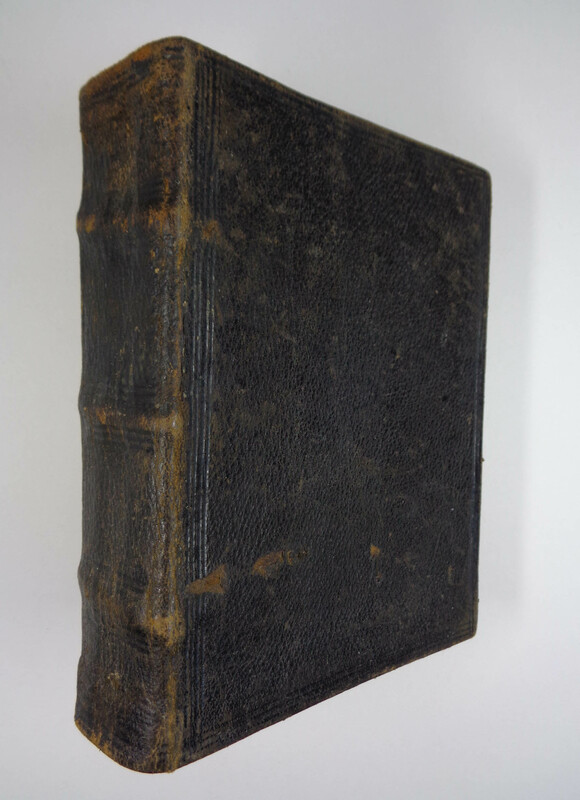 First edition (variant issue) of the first work devoted exclusively to the criminal law of Scotland, by George Mackenzie, Lord Advocate and "a considerable scholar", as well as the man who has come down to us as "Bloody Mackenzie" in his former role. An acceptable copy, definite browning, in a later full calf. Printed by James Glen, Edinburgh, 1678. London: Printed for Tho Basset, Ric Chiswell, Benj Tooke, Tho Passenger, Geo Dawes, Tho Sawbridge, M Wotton and G Conyers, 1678. [Preface xxxii]+[Contents 24 unpaginated]+[Life 41]+[blank]+[History 813]+[8 table] pages with and allegorical frontispiece and accompanying poem by Ben Johnson and another frontispiece and doubled 8 page maps. 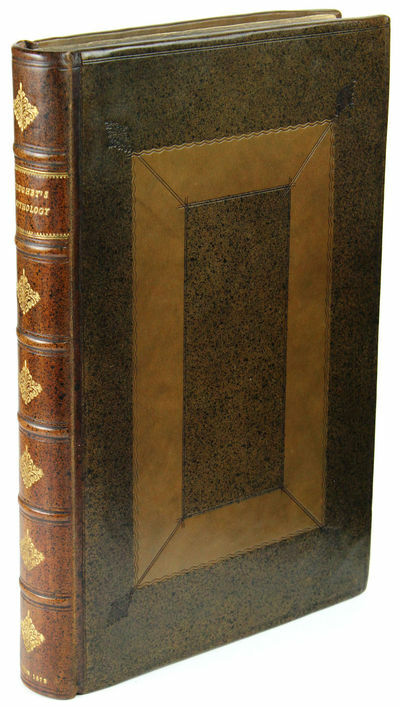 Folio (15 1/2" x 9 3/4") bound in original brown leather with seven spine compartment in decorative gilt with raised bands and red label in gilt and decoratively tooled cover. The Life has its own title page: The Life of the Valiant and Learned Sir Walter Raleigh, Knight. With His Trial at Wincester. The Third Edition (Armitage: 47) Tenth edition.From 1614 to 1687 appeared a succession of folio editions of this work, possessing many features in common. 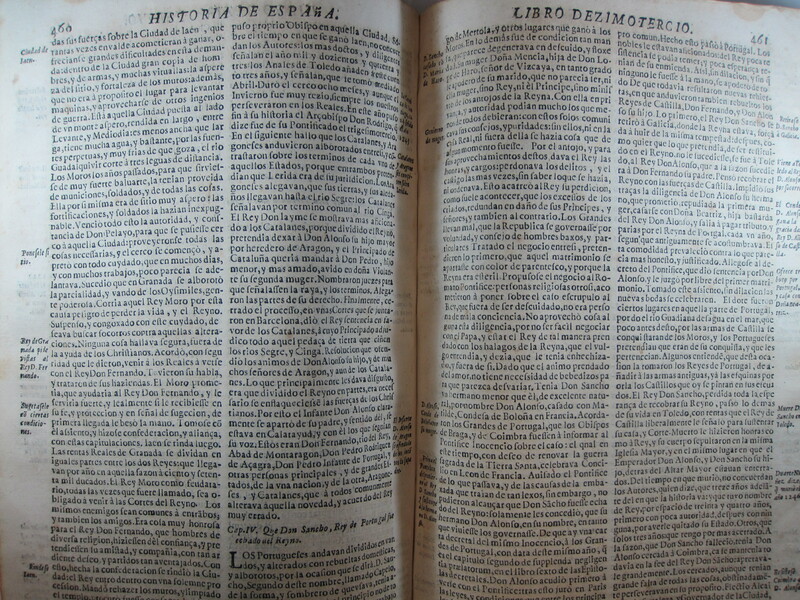 The title-pages of all (excepting that of 1614, which is a destitute of one) are headed The History of the World. In Five Bookes., there being a slight variation in some of the edition in the mode of spelling the words, e.g., "Historie," "Fiue"; and contain a brief list of the contents of each book.In the years before writing this great tome, Raleigh was in and out of the tower of London a number of times. Raleigh was born to a Protestant family in Devon, the son of Walter Raleigh and Catherine Champernowne. Little is known of his early life, though he spent some time in Ireland, in Killua Castle, Clonmellon, County Westmeath, taking part in the suppression of rebellions and participating in the Siege of Smerwick. Later, he became a landlord of property confiscated from the native Irish. He rose rapidly in the favour of Queen Elizabeth I and was knighted in 1585. Raleigh was instrumental in the English colonisation of North America and was granted a royal patent to explore Virginia, which paved the way for future English settlements. In 1591, he secretly married Elizabeth Throckmorton, one of the Queen's ladies-in-waiting, without the Queen's permission, for which he and his wife were sent to the Tower of London. After his release, they retired to his estate at Sherborne, Dorset. The Queen died on 23 March 1603. Raleigh was arrested on 19 July 1603, charged with treason for his involvement in the Main Plot against Elizabeth's successor, James I, and imprisoned in the Tower of London.He remained imprisoned in the Tower until 1616. 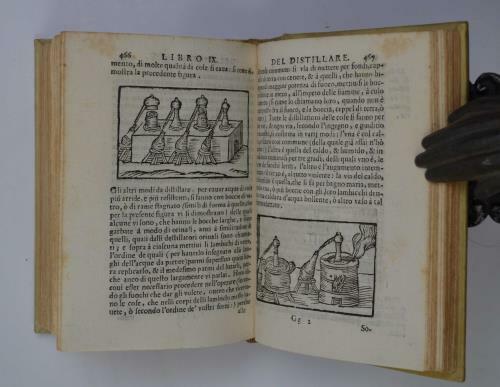 While there, he wrote many treatises and the first volume of The Historie of the World (first edition published 1614) about the ancient history of Greece and Rome. His son, Carew, was conceived and born (1604) while Raleigh was imprisoned in the Tower. In 1617, Raleigh was pardoned by the King and granted permission to conduct a second expedition to Venezuela in search of El Dorado. During the expedition, a detachment of Raleigh's men under the command of his long-time friend Lawrence Keymis attacked the Spanish outpost of Santo TomÃ© de Guayana on the Orinoco River, in violation of peace treaties with Spain, and against Raleigh's orders. A condition of Raleigh's pardon was avoidance of any hostility against Spanish colonies or shipping. In the initial attack on the settlement, Raleigh's son, Walter, was fatally shot. Keymis informed Raleigh of his son's death and begged for forgiveness, but did not receive it, and at once committed suicide. On Raleigh's return to England, an outraged Count Gondomar, the Spanish ambassador, demanded that Raleigh's death sentence be reinstated by King James, who had little choice but to do so. Raleigh was brought to London from Plymouth by Sir Lewis Stukeley, where he passed up numerous opportunities to make an effective escape. Raleigh was beheaded in the Old Palace Yard at the Palace of Westminster on 29 October 1618.Condition:Spine ends professionally repaired, facsimile "Raleigh" signature affixed to second frontispiece, old signature to front past down else a very good copy. Leerzaame zinnebeelden, . Tweede druk.Haarlem, Jan Bosch, 1757. 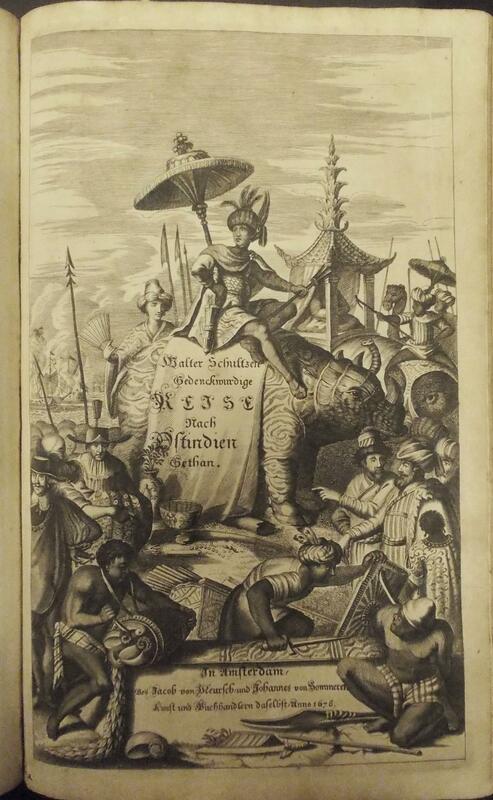 With engraved frontispiece and 50 beautifully engraved emblems in text. With: (2) SPINNIKER, Adriaan. Vervolg der Leerzaame zinnenbeelden, Spiegel der boetvaardigheid en genade en eenige stichtelyke gezangen.Haarlem, Jan Bosch, 1758. With same engraved frontispiece (with revisions), 30 engraved emblems in text and 4 engraved emblems on plates with letterpress text. 2 volumes bound as 1. 4to. Contemporary gold-tooled, tanned sheepskin. - Landwehr, Emblem books Low Countries 759 & 760; Praz, p. 502. Second edition of volume 1 and first edition of volume 2 of a very attractive emblem book by Adriaan Spinniker (1678-1745). Together they contain 84 beautifully engraved emblems: 80 by Vincent van der Vinne (who also drew and engraved the frontispiece used for both volumes, with its title revised for the continuation) and 4 (for the Spiegel) by J.C. Philips. Isaac van der Vinne's father and nephew were both named Vincent, but the present artist-engraver was probably the nephew (1686-1742). The emblems show scenes from the Bible and are followed by brief excerpts from the relevant parts of the Bible and longer verses giving further information about it. Spinniker was a minister of the church for the Mennonite Congregation in Amsterdam. In fine condition, with only an occasional minor spot. The binding has a few scuff-marks and some cracks in the spine, but is otherwise very good. 4to., 24pp., bound in 20th century marbled boards with title in gilt on red morocco spine label. A very good crisp copy.Publisher: London, printed for Brabazon Aylmer at the three Pigeons in Cornhill,Year: 1678Edition: First edition. 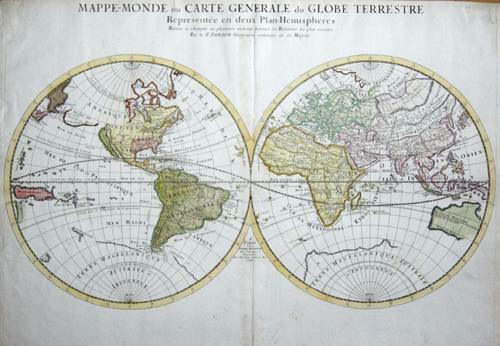 Mappe- Monde ou Carte generale du Globe Terrestre. Artist: Seutter Matthias ( - 1757 ) Augsburg; issued in: Augsburg; date: 1728 1678 - - technic: Copper print; colorit: original colored; condition: Very good; size in cm : 50 x 57 - Vita of the artist: Matthias Seutter (1678- 1757) Augsburg was the son of a goldsmith in Augsburg. In 1697, Seutter began his studies in Nuremberg and subsequently worked in the publishing house of Jeremias Wolff in Augsburg. In 1710, he established his own publishing house and print shop. The Seutter publishing house produced a great number of maps, atlases, and globes. 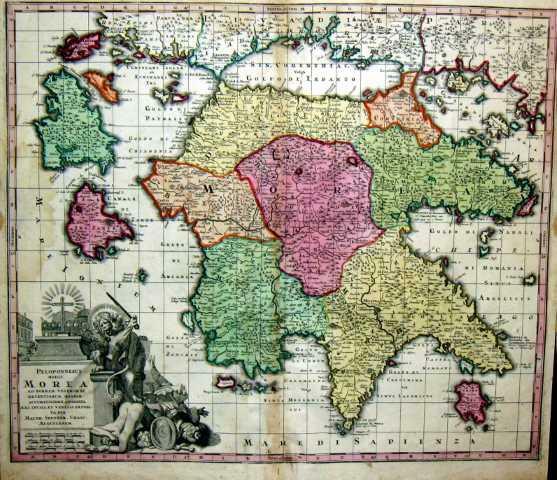 However, very few original maps were printed there, as Augsburg at that time had no university and no connection to the fields of mathematics or the natural sciences. Seutter therefore copied the work of other cartographers, making his own engravings based on their models. Over 500 maps were produced in his studio. Seutter's most well-known works are the 1725 "Geographical Atlas or an Accurate Depiction of the Whole World" ("Atlas Geographicus oder Accurate Vorstellung der ganzen Welt") with 46 maps, the 1734 "Large Atlas" ("Grosser Atlas") with 131 maps, and the 1744 pocket atlas "Small Atlas" ("Atlas minor") with 64 maps. Matthäus Seutter died in 1757. Seutter's son Albrecht Karl, his son-in-law Conrad Tobias Lotter, and his business partner Johann Michael Probst ran the printing business for five more years. 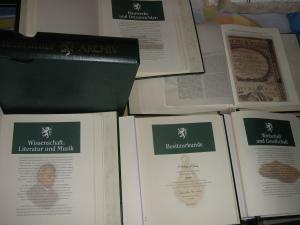 Universallexikon von Württemberg, Hohenzollern und Hechingen. Mit Nachträgen und Berichtigungen von Dr. Carl Pfaff. VI Seiten, 1678 Spalten, 1 Seite Berichtigungen, IV Seiten, 246 Spalten. 1 Seite Druckefehlerverzeic Gr.8 Halbledereinband Auf dem Titel zwei alte Besitzstempel. Die unteren Ecken bestoßen. Im Anhang eine mehrfach gefaltete und von Hand grenzkolorierte "Charte des Königreichs Württemberg und der Hohenzoller'schen Fürstenthümer. 1840". (Gezeichnet und in den Stein gestochen von E. Winckelmann in Stuttgart. 45 x 35 cm). Zweite Ausgabe. Vetus academia Jesu Christi, in qua XXII. priscae sinceraeque pietatis professorum icones exhibentur. Augsburg, J. Koppmayer 1671. 4°. 12 Bll., 221 S., 3 Bll., mit Kupfertitel, 1 ganzs. Kupferstich (Titel verso) u. 22 blattgr. Porträtkupfer im Text.- Angeb. : Ders., Templum honoris reseratum, in quo L. illustrium aevi hujus, orthodoxorum,. theologorum philologorumque imagines exhibentur,.Accessit viri insignis Antonii Reiseri. 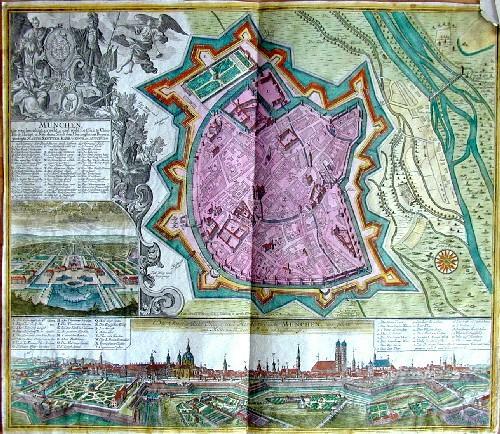 Augsburg, J. Koppmayer 1673. Kl. 4°. 5 Bll., 415 S., mit Kupfertitel u. 50 Porträtkupfer v. Melchior Haffner u. G. C. Seitz (1) im Text, Ldr. d. Zt. Format: 82,5 x 103 cm. Gerahmt. *Prächtiger barocker Stammbaum in Großformat. Unten mit Landschaft und kleinem Bild der Westerburg, mittig mit verzweigtem Baum und den Eintragungen der Ahnenfolge von 788 bis zum Jahr 1678 (letzte Eintragung). Rückseitig mit Nachlaß-Etikett des Grafen Konrad Graf zu Leiningen Westerburg sowie mit handschriftlicher Provenienzgeschichte und eine Zuschreibung an die wahrscheinliche Urheberschaft des Barockmalers Johann Martin Seekatz (1680-1729) aus Westerburg. Dieser war 1709-1925 Hofmaler der Grafen Leiningen-Westerburg. - Stammsitz des Grafengeschlechts war über 900 Jahre das Schloß Westerburg, das im ausgehenden 20. Jahrhundert an einen Investor verkauft wurde und heute nach Umbau ein innovatives zahnmedizinisches Zentrum und ein Hotel beherbergt. - Farbiges Aquarell auf mehreren zusammengesetzten Papierbögen. Ränder etwas fleckig und fachmännisch restauriert - In insgesamt gutem Zustand. In neuerer Zeit gerahmt. 6(Sechs) beinahe neuwerige Kunststoffordner in Schubern, diese haben eher geringe Gebrauchsspuren.Min. 340 neuwertige Einlageblätter zu den Themen: GeschichteKunstschätze Wis- senschaft,Literatur u MusikBauwerke u Ortsansichten Wirt- schaft u Gesellschaft.Reprint Landkarte Stmk. v. Vischer aus 1678.Stichwortregister.3-4 kl Flecken innen,eine Folie ge- knickt. - Chez Sebastien Marbre-Cramoisy, à Paris 1678, in-12 (9x15,5cm), (2) 370pp. (1), relié. - Edizione originale. - [FRENCH VERSION FOLLOWS] Edition originale, rare. Reliure en plein veau blond glacé XVIIIe. Dos à nerfs richement orné. Pièce de titre en maroquin rouge. Fente en tête au mors supérieur. 2 coins émoussés. Légers frottements. Nom d'un possesseur biffé en page de titre. Note ancienne en page de garde à la plume. Bel exemplaire, bien relié. Ces Lettres paraissent peu après la première édition de La Princesse de Cleves (1678), et elles sont d'une importance cruciale pour l'histoire des belles-lettres. Valincourt commence par retracer l'histoire de l'oeuvre, qui était bien connue avant d'être publiée. Il en fait un compte rendu détaillé, suivant la nouvelle pas à pas, à l'aide de considérations historiques et critiques. Si l'ouvrage de Valincourt est assez laborieux, paraphrasant la nouvelle à l'aide d'un postulat réaliste et interrogeant les possibilités psychologiques, stylistiques et narratives, il n'en reste pas moins qu'on dispose de peu de document de ce genre : un témoignage contemporain sur un livre emblématique de la littérature française. Nieuwe en seer nette Caart van de Baay en Stadt GIBRALTAR. Geteckent door den Wel Ed. Hr. H. Leynslager Cap. in't Edel Moogende Collegie ter Admiraliteyt alhier. 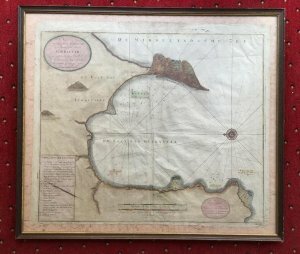 -- Niederländische Seekarte der Bucht von Gibraltar - westorientiert - mit Windrose, nautischen Linien, Sandbänken mit Tiefenangaben. 2 Kartuschen sowie Legende A-L und Meilenzeiger deutsch und französisch. Gibraltar, die Küstenlinie sowie einige markante Punkte mehrfarbig koloriert.